Christopher McIntyre and Robert Burns visit the Museum on July 24, 2013. Photo by the author. Ranging from a Wisconsin 30 artist to a young woman visiting the Milwaukee Art Museum for the first time, this week’s conversations are as marvelously varied as the parcipants. Friends Christopher McIntyre and Robert Burns are residents of Milwaukee, Wisconsin. Meanwhile, Robert Burns came to the Milwaukee Art Museum to view the 30 Americans exhibition with Christopher. Robert is a father, business owner, and artist. He primarily conducts exploratory photography, photographing the tunnels throughout Milwaukee as well as documenting the city’s street art. Christopher: The city needs it, the fact that this is the first time in the Midwest that 30 Americans in being brought, the fact that they brought it here, at one point the most segregated city in the United States. It speaks a lot about the progression of the city, the fact that the city is ready to accept it. From numbers that I have heard, the first weekend it opened almost 10,000 people came, so I was pretty enthused, the fact that people are receiving it well. The art, it speaks volumes and shows the artist’s depth and how they understand art history, how they are masters of certain mediums, and how these artists did not just meet together and say, “you know, we’re going to make an exhibition.” The Rubell family collected these pieces and they just flowed. It is all organic and it is really beautiful. Robert: Oh, I was surprised by what I saw. My main reflection was on the Duck, Duck, Noose [by Gary Simmons] piece, I had seen hoods like that before, but I had always assumed they were pillowcases with holes cut in them and I just found it totally disturbing that people manufactured like church-quality hoods like that…that is just a whole other level of hating people, needing special outfits to do it in? That is just a new idea to me; it is almost militarized- trying to create that uniformly. And how does that relate back to the art you think? Robert: Wow, I think it really helped underline that hate’s the reality. For me, it took the idea of seeing photographs of burning crosses and stuff and just makes it really more relevant, especially the way they’re manufactured by a seamstress, a super-hateful seamstress…that is just a bizarre idea to me. Christopher: Just come. Don’t think about it, just come. If you miss this, you are doing yourself a disservice. If you do not, you really do not like art – I’ll say it, you really do not like art if you do not come to this exhibition. That’s a charge… you had better come here. Robert: Come to this [exhibition. It]… is fantastic; I need to walk through all of this again. I think it is really interesting that this was collected by a single family… because that is a really interesting way to curate a show. You know, often times people just come up with an idea to curate a show or someone knows an artist… this was done over time and I would be curious to go back and find out how much time this was collected across. Robert: The piece that stuck with me was the huge woodcuts along the back wall [Untitled by Kerry James Marshall], that was really cool… The size, and I love the color palette. I love woodcuts like that, it really just kind of pulled me in. Also how there are several pairs of them that seem like they could be their own piece. 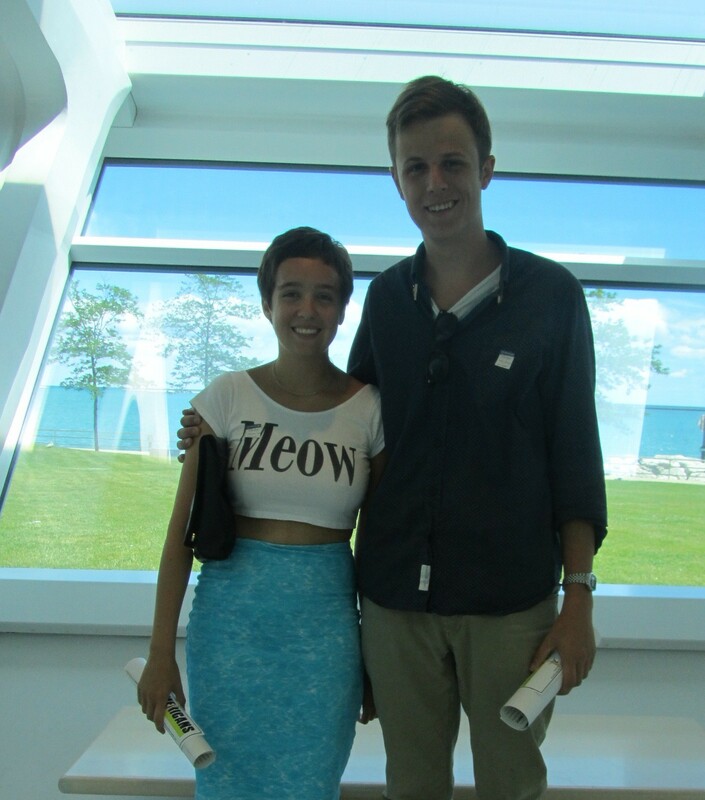 Justin Henry and Marissa Mindiola visit the Museum on July 24, 2013. Photo by the author. Justin Henry and Marissa Mindiola have been dating for several years and currently reside in Waukesha, Wisconsin. A lifelong inhabitant of Wisconsin, Justin is a full-time college student, who will be transferring to UW-Milwaukee this spring. During the evenings, he works in a warehouse. His opposite, Marissa has moved to five states with her most recent relocation to Wisconsin three years ago. She works with children at a Unitarian Church, which her siblings and mother attend for services. Beginning this fall, Marissa will join Justin at UW-Milwaukee. 1 What did you think of the exhibition? Marissa: I really enjoyed it. I always like it when I go into an exhibit and I only recognize two or three of the artists because then I get to learn about a bunch of other artists that I would never have known about if I did not come. We were talking about something in the gift shop that we thought was interesting… [Hank Willis Thomas] did the two pieces on the Nike “V” branded on the head [Branded Head] and the chain on his foot [Get off on the Right Foot 1988/2007]. We thought it was odd that the postcard of those pieces were being sold in the gift shop when the pieces are comments on consumerism and the idea that you could own a person, but then you could now literally own a postcard of this piece… A lot of pieces touched on consumerism and how the media portrays some things as being for black people and then everything else is, by default, for white people. Justin: I noticed that the exhibition was here because I really like the Kehinde Wiley piece you already have here by him [St. Dionysus from the Museum’s permanent collection] and I noticed that you that he was some of his other work was here [temporarily for the 30 Americans exhibition]. Marissa: Do it not because it is a spectacle, or because it is exotic… [but] because you do not want to make it into a spectacle. You can want to observe it for what it is because it is just as valuable as any of the other artwork here… Especially if it [the history] is not something that you think about, or if racism and segregation is something that you want to avoid… you will not be able to avoid it here… Don’t come if you are trying to avoid history. Justin: I also really liked Jeff Sonhouse. His art was really good and she [Marissa] pointed out the diamonds thing that I never noticed. Justin: Where they [the diamonds] have just been burnt. And then in this painting [Visually Impaired] there are no diamonds in this painting. I thought that was really nice because the shimmer was still there… They were beautiful and I liked the way they contrasted because… [Exhibit A: Cardinal Francis Arinze] was based on another one. Sheri and Emma Robertson visit the Museum on July 24, 2013. Photo by the author. Sheri and Emma Robertson are mother and daughter visitors from Columbus, Mississippi. 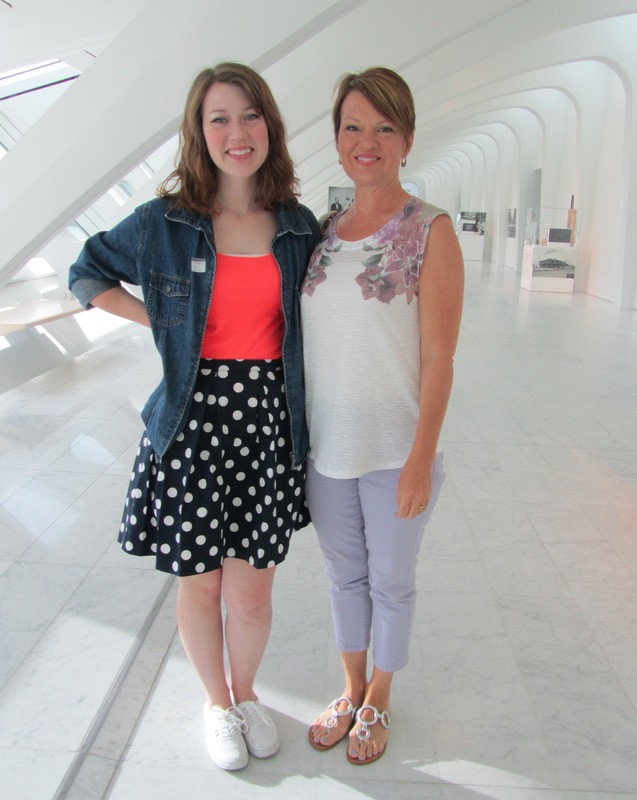 Sheri Robertson, a high school science teacher, grew up in Wisconsin and fondly remembers visiting the Milwaukee Art Museum She came to the Museum for the day to share memories with her daughter. Simultaneously, Sheri hoped to experience the new building, completed by architect Santiago Calatrava in 2001, and view what the museum currently has to offer its visitors. While Sheri is a high school teacher, Emma is a rising senior at the Mississippi School for Math and Science. Emma is considering following in her mother’s footsteps by likewise becoming a teacher. Sheri: I thought it was really interesting. I mean, there were parts of it that was kind of sad to me because of the history of African Americans…especially the portion of the exhibit with the Ku Klux Klan masks, Duck, Duck, Noose – that one was especially hard and had an impact on me. Living in the South, I think we can relate to some more of those things than most people, just because we are from an area where there is still so much racism. The Civil War just does not seem like it was that long ago when you’re in the South… people still kind of hold those same lines. I also liked the parody found in some of the paintings, taking an old classical painting and reflecting on the thing that has changed. Emma: I really liked it, it captured a broad spectrum of emotions for me…some of it was very sad, but then some of the brighter pieces were very joyful and captured the more fun and urban side of African American history. Some of the stuff from the past was really emotional, like the Ku Klux Klan thing. Being from the South I see that history in the South a lot, with people stuck in the past. There was some old stuff and some new stuff and I really liked that. Sheri: I think it [the exhibition] is something that everybody should see… it was controversial and provocative, but it went outside of the box of what you would expect to see in an art museum. We did not know what to expect, so it was a nice surprise! Emma: I think it’s a good opportunity to learn some history and see some emotion in art that actually raises the emotions out of you and is not just there. It actually interacts with you. Sheri: We spent a lot of time in Birmingham, so the one that I could relate to the most – because we had seen the sight of the fire – was the old church sign, the cross, because we knew exactly where that took place. Also, the Duck, Duck, Noose, that was not necessarily my favorite, but that one… elicited the most emotion; the one that I will not forget. Special thanks to fellow Curatorial Intern, Anneliese Verhoeven for her assistance in the production of this week’s article. Check back next week for 30 Encounters with 30 Americans: Conversations VII – IX. 30 Americans is at the Milwaukee Art Museum from June 14 through September 8, 2013. For more information, please click here.